Okay... My handbox did not go dark/blank when connected to my laptop (except for while updating the firmware). But... I cannot get Stellarium to work with my telescope. When I attempt to add a new telescope, my Bresser GoTo driver is not listed. If I load the POTH app included with the firmware update, then I can indeed control the telescope mount through the POTH app but this is not graphical control. It is simply the digital version of the arrows on the handbox. I've tried going into Stellarium after starting the POTH app... still no joy in Stellarium. Something tells me that Stellarium is not recognizing the Bresser driver or can't find it. I've spent an hour or so on this already this morning and, at the moment, it already seems to be far more frustration than it is worth. I should have simply stuck with the idea of using my handbox as my primary GoTo controller. Regardless, I'll continue to do more research to see if I can figure out this nonsense. I haven't messed around with mine much, however I seem to recall that the instructions (such as they were) stated to use the ASCOM POTH Hub driver, and to select the EXOS2 from that driver's setup. That's the only configuration that works for me - ASCOM crashes if I select the EXOS2 driver directly, haven't yet figured out if it is a 32 vs 64 bit driver issue or some other problem. Going through the POTH Hub I seem to be able to send slew commands from TheSkyX. Haven't yet tried a sync to see if that works correctly. The functionality is definitely barebones. The few times that I've messed around with it, using the arrow buttons in the graphical driver had about a 1 second lag before the mount started moving, and then it gradually ramped up the slew speed, requiring a second click to stop slewing. Didn't seem to matter what slew speed I selected. Much harder to move accurately than using the hand controller slew buttons. Initial test GoTos resulted in RA slewing, but no Dec motion, I haven't gotten back to it to sort it out yet. Somewhat less than impressed so far (being used to EQMOD and the Astro Physics ASCOM drivers) but maybe it's user error on my part. After some additional research, I decided to give Cartes du Ciel a shot. That is such a different program than Stellarium that I found it quite awkward to get around in the program. After finding myself rather lost in that program, I figured this was not the direction to go to solve my issues so I decided to go back to Stellarium. I went back to doing more research about getting Stellarium to work since I prefer that program and I found that I needed to download and install Stellarium Scope also (that's what some say, anyway). This is the first that I heard of the need to do that. At first, I still couldn't get it to control the EXOS-2GT but after opening and closing Stellarium and Stellarium Scope and then re-opening each, I somehow got it to work. Right now, however, I am not sure of the sequence of things. I'm going to need to put aside a few more hours of screwing around with this to understand it all and come up with written steps on how to do it each time. It all seems very un-user-friendly with a rather specific sequence of events that need to happen in the correct order. Even though I am more adept at computer-related tech than most, for me, this long-awaited computer control ability is far more user-unfriendly than just using the handbox. The thought of adding my guiding scope into the mix is making me think it will probably prove to be even more unfriendly and obtuse. If there is a software package to buy, rather than piecing together free programs, I'm all for it if it will significantly simplify things with ease of setup and work fluidly upon installation. Right now, after spending hours on this, I'm not impressed and I feel it is just making things unnecessarily complicated... which is the opposite of the purpose of adding computer control. Hey FlankerOneTwo... It sounds as though I may have stumbled upon a little more success than you have. Unfortunately, I'll probably struggle again to get the sequence of events just right again so things will work as they are supposed to again. I managed to get Stellarium to tell my EXOS-2GT to slew to specific targets. I'm using it indoors for these testing purposes so I can't comment on accuracy though. It seemed to work just fine though. If I remember correctly... I needed to set up my Bresser driver in Stellarium... name the scope mount... then close Stellarium... then run Stellarium Scope... enter the appropriate info there and choose the appropriate drop-down menu items... then go back to running Stellarium... click on the Telescope Control icon in the toolbar... and then I had control of my mount through point and click within Stellarium. It was awkward to get to that point though. And, don't hold me to the sequence of events to get to that point. I'll need to do it again (maybe two or three times) while writing down each step to know the sequence for sure. I played around with Stellarium, Stellarium Scope, and the mount. It seems to be working now. While the Windows tablet (Surface 3) boots up... I initialize the mount using the handbox. It seems to be good to go from there. Two little quirks... 1. One time, my handbox started beeping and wouldn't stop and then the tablet crashed. I have no idea what that was about. 2. Since I'm on a tablet with no keyboard, getting the mount to slew using 'Ctrl+1' is awkward. I could use the 'Slew to...' dialog but that is just as awkward. Too bad I can't just double or triple tap a target and the mount would just go... or, hold down my finger on a target to get a popup menu where I can select 'GoTo'. Edited by PatrickVt, 10 December 2018 - 05:31 PM. Great updates, Patrick! Thanks for posting. I’ll be testing with Cartes, but Stellarium is another option I also have. Weather is not cooperating.. I have been following this and it sounds great that it is working but can this go wireless? Hi John55... That's a good question. At the moment, I figured out how to crawl when it comes to this mount and computer control... I'm hoping to get to a point of ease in walking soon... maybe then I'll be able to run... then, I'll begin to look into flying wirelessly! That being said, I suppose that if you had a good wireless USB to USB device, it should work. Hopefully I'll get some time and energy to play around with using Stellarium with the mount this afternoon... or at least in the next day or two. If anyone else makes headway here, no matter which software packages, I hope it is shared here as well. Thanks. Great Patrick, thank you for doing this. Is there away you can make snap shots on the sequence when you have it? I just spent about an hour working with Stellarium. Well... I only got to spend about 15 minutes working with Stellarium. I spent 45 minutes trying to get the mount to communicate with Stellarium. First, I started Stellarium Scope... checked the "Connect" box... then clicked on the "Start Stellarium" button. Stellarium opened... clicked on the telescope icon on the bottom toolbar... nothing was working (no communication with the mount). I then went back and forth between programs with no luck. Then, eventually, I decided to reboot the computer and reconfigure the mount... eating up more time. This time, the "Scope" reticle was over Polaris so that was a plus. Then I chose a target and pressed Ctrl+1... and I got the Windows Error sound but, surprisingly, the mount slewed. So I tried the Slew window in Stellarium (rather than using Ctrl+1 since I got the error sound).... chose a target... clicked on "Slew"... got the error sound again but it slewed to the target. I continued slewing to various targets and it worked but I kept getting that error sound for every slew. So, what have I taken away from this experience? Trying to use the computer with this mount to quickly and easily slew to targets seems to be a tremendous waste of time, effort and resources. It would be far easier and far faster for me to simply spot a target on my computer screen (in Stellarium)... then pick up my handbox and select that target name on the handbox and hit Go. Right now I'm feeling like I'm wasting my time with all of this. It seems to me that this new development in this latest firmware update is only making things more complicated, very finicky and quirky, and with far too many errors between successes. I feel that if I had a clear night here, for a change, and set up everything outside... did my Polar Alignment... set up the rest of my gear... then wasted 45 minutes getting this computer control to work... my night would be ruined because I would be frustrated and I would no longer have any desire to waste more time. I'm trying to find ways to ease the burden and time required in setup and in using the telescope but this, at this point, this not helping in the least. The irony here is we all felt slighted when, after purchase, we realized the port on the handbox for computer control didn't work. We all hoped that a firmware update would resolve that issue. When the firmware update finally arrives... it is less than impressive (I could add a few more other colorful, descriptive words here but I'll restrain myself). If someone else has some ideas, I'm all ears. I'd like to try Starry Nights but don't want to buy it until I'm sure it will working seamlessly, as it should. Stellarium with this mount is not even close to seamless. It sounds like you had to reconfigure the mount before it could be used for goto in stellarium. I bet every every time you want to use the stellarium goto you'll need to reconfigure. Can you try again with while doing the reconfiguration in Stellarium and see if it works the first time? Coleton... Yes, I will do that. I will probably have a little time to play with this again in the morning. Yes, there is no doubt that, at the moment, I find the whole firmware upgrade underwhelming, disappointing and even frustrating as it relates to computer control as well as the actual update itself. You are right that I am putting far more effort into this than should ever happen with any firmware update. 1. Other than the handbox operating system/menu system being clunky with an ancient DOS-like interface (which is frustrating considering we are about three decades beyond DOS times), I honestly had no problems with GoTo or tracking. I'd do a one star alignment after an accurate polar alignment and I'd be done. For astrophotography work, I use an autoguider connected to the mount. Should alignment be more like Meade and Celestron? Yes, I admit that would be very nice and it would indeed be a step forward although their interfaces could also take a giant step into this millennium. So I really only have two complaints about the handbox... those ear piercing beeps that can't be turned off using the handbox and, as a result, echo through the neighborhood in the middle of the night like a construction vehicle in reverse right outside bedroom windows and the clunky interface from the 1980s. 2. From my point of view, the most sought after update to the handbox has been adding functionality to the handbox jack for computer control. This firmware update addressed that so that is a plus and is an indication that Explore Scientific and Bresser are listening. This was my only interest in this firmware update but I am quickly losing interest because computer control with this system is actually slow, frustrating and worse than "clunky" because thus far it has been so difficult to get it to work each time.. At this point, I'd rather use the handbox for control. I should also acknowledge that I understand that perhaps programs other than Stellarium are more fluid and more stable. All I have to test is Stellarium. Perhaps using a different computer would make a difference too because it is feasible that there could possibly be some hardware conflicts. I am toying with the idea of setting up the mount near my desk where my desktop computer resides to see if I continue to have the same complaints when using my desktop computer rather than my Surface tablet. It should be said, however, that I am disabled and have limited energy each day and, as if that is not enough, I also have extensive spinal injuries so there really is only so much I can accomplish each day. Moving this mount from one end of the house to the other is not very high on my priority list as a result. That being said, I'll see what I can do. Here is another complaint about this firmware update... The actual act of updating the firmware could have and should have been far easier and more fluid. That alone was frustrating and time consuming because the little bit of instructions that were provided were lacking pertinent information. I update the firmware on photography gear all the time so I know that these updates can indeed be as simple as plug-and-play. Then, the update added computer functionality but I do not know of any instructions on using this handbox with various software packages. Adding functionality and then leaving your users to experiment with figuring out how to make it work is absurd. User documentation is poor. I will, however, spend a little more time and energy trying to see what I can learn about controlling this mount with Stellarium. And, I'm still hoping to hear from some other people about experiences with other software packages. I've spent the past two hours trying to find some consistent way to get Stellarium Scope, Stellarium and the mount to play together with no success. Actually, today, I couldn't get it to work correctly even once. Sometimes, Stellarium showed my mount in the SE sky upon opening the program and while it was actually in the parked position at the CNP. Attempting to Sync it back to CNP never worked once. Actually, even in my successful uses yesterday, I was unable to sync to a different spot. Sometimes, Stellarium showed my mount in the correct position at the CNP upon startup and it would slew to the first target but subsequent targets were nowhere even close. For example, I would slew to a target from CNP... it would slew to where I think this target would be (I'm testing in daytime so this is just a judgement call but I am certain it is pointing in the correct area of the sky)... then I would have it slew back to Polaris but it wouldn't even be close because it was obvious that the mount wasn't even close to being back to the parked position. So that is no success. Most of the time, I couldn't get Stellarium to do anything with my mount... only error beeps (Windows exclamation sound). Between each try, I would reboot... and then click the "Update Stellarium Configuration" button in Stellarium Scope... no joy. So, two hours of screwing around with this today and not a single successful attempt at accurate computer control. At this point, I have absolutely no desire to waste more time and energy on this. If someone comes up with a viable solution, I'm all ears and I will give something different a try. For now, I'm out but I'll continue monitoring this thread for updates. I really do hope someone else has a much better story to tell. Edited by PatrickVt, 13 December 2018 - 11:49 AM. Although I do wonder what the USB jack really is for, the $30 cable is needed for computer control of the mount and that really is the primary reason for this firmware update. So to take advantage of the new firmware computer control feature, you would need that cable to use every time you want to use the computer to use point-and-click GoTo functions. The real problem is getting it to work and not the fact that you need to purchase a cable. I do agree, however, that these mounts are 25-30 years behind the times but... if I'm stuck using this old technology, I definitely prefer this handbox with far more lines of info right at my fingertips. It is far better than having only two lines of info like the entry-level competition. I wasn't aware the cable was needed for computer control - that's almost even more of a slap in the face then just having to use it once lol. Why is the USB port there then, what a waste. The first Apollo missions had better on board computers than this. A quick update... I've been in contact with Jerry from Explore Scientific. He advised to start the POTH Hub connected with the Bresser ASCOM driver.... then start Stellarium Scope connected with POTH Hub.... and then start Stellarium. Maybe some will have some luck with that sequence. I did a quick try but it still did not work for me. Most of the time, Stellarium Scope was crashing on me. This afternoon, I noticed that somehow my location coordinates in Stellarium are always changing to a latitude 4 degrees higher. I cannot figure out why that happens every time. I'm also getting a date mismatch in POTH Hub.... the computer time and the sidereal time are different by 1 day. POTH fixes the mismatch but I can't figure out why that is happening either. The date and time and time zone are correct on my computer... and I actually use that info when I initialize the mount. I'm thinking that I must be missing something somewhere. Anyway, Jerry at Explore Scientific has been great and I have no complaints about Explore Scientific. If I don't write this afternoon, I probably won't get a chance to write again until Monday so I figured I should write a short update. I again tried connecting with Stellarium using Jerry's suggestion (mentioned in a previous post of mine). I could not get it to work on my Windows tablet at all. Sometimes the program would start and show my telescope but the telescope reticle would never move. Other times it would freeze completely. Other times Stellarium Scope would drop out. There really seems to be a conflict between Stellarium Scope and the ASCOM driver. First thing this morning while I was still feeling well and energetic, I moved my EXOS-2GT to the opposite end of the house so I could try it on my far faster and newer desktop computer. Long story short, no joy. I had the same issues so I didn't spent much time on it. I've given up on Stellarium and Stellarium Scope working with this mount. While I was near my desktop, I decided to see how Cartes du Ciel would work.... and also Starry Night 7 Pro Plus.... both seemed to work as they should. I'm not a fan of CDC so I only tried it once, saw it worked, and moved on to Starry Night. Starry Night worked very well. Connection was fast and everything worked fluidly. I do have one little problem with Starry Night though... when the telescope reticle appears on the screen, rather than showing a name or "Scope" as Stellarium does, it showed something like "Please customize telescope short name" in red text. Unfortunately, I cannot for the life of me figure out where or how to do that. I'd like to simply name it EXOS2GT. I still need to play around with Starry Night more to ensure it is working correctly with the mount but, so far, it appears to be a solid program for this purpose. Thank you for your update Patrick. Stellarium is my preferred telescope control software as well. It is unfortunate that Stellarium doesn't work. In my opinion, starry night is better than stellarium anyways if you pay the price to get it (cant beat stellariums price😉). Do you know if the scope worked with Starry night 6? If not, Cartes Du Ciel can always be a last resort for me. I am ordering the mount tonight and hopefully I can work out the kinks before planet season comes around. So I got this upgrade and firmware is updated. I turn my mount on and let it initialize and then plug the cable into handset and all is well. I can operate through stellarium and worldwide telescope now. The only trouble I’m having is with phd2. It shows to connect but it does not appear to be sending move commands via ascom with manual control screen in phd2. It is clearly working with on camera connected tho. I have not tested goto's for accuracy only tested for control of mount. Next clear night i'll get it out and see if the accuracy is any better using Stellarium than the hand controller. Edited by Typlan1, 16 December 2018 - 05:38 PM. Yes, unfortunately the driver does not implement the pulse-guiding command. Edited by Jerry Hubbell, 16 December 2018 - 06:57 PM. How were you able to get the mount connected to stellarium? Patrick and I are having a hard time with this process. I'm not sure how much of it is actually working. It slews to object in both Stellarium and Worldwide telescope and follows the mount as i slew with hand controller. With Stellarium i downloaded Stellariumscope and use it as go between from computer to mount. I will take screen shot and upload for the settings in stellariumscope. Once the settings were right i hit the update stellarium button and it loaded the settings into stellarium under available telescopes. I have found that it seems to work every time if i start my mount with the cable disconnected from my hand controller and connected to my computer. Go through initialization and then connect the cable to hand controller. 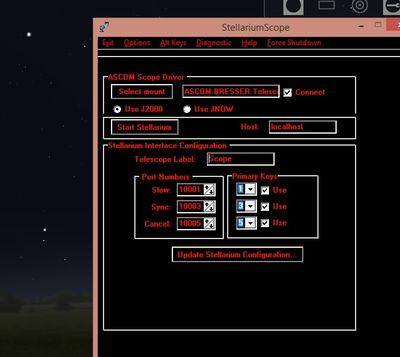 Then i fire up stellariumscope and make sure its saying the localhost ports are showing connected then start stellarium. Worldwide Telescope was much simpler to connect. Just went to telescope menu and selected driver under the setup button, hit connect and it was up and running. slews work, park button works, sync button works. directional buttons did not work. If the slews are accurate ill be happy with the 30$ spent. Edited by Typlan1, 16 December 2018 - 10:11 PM.